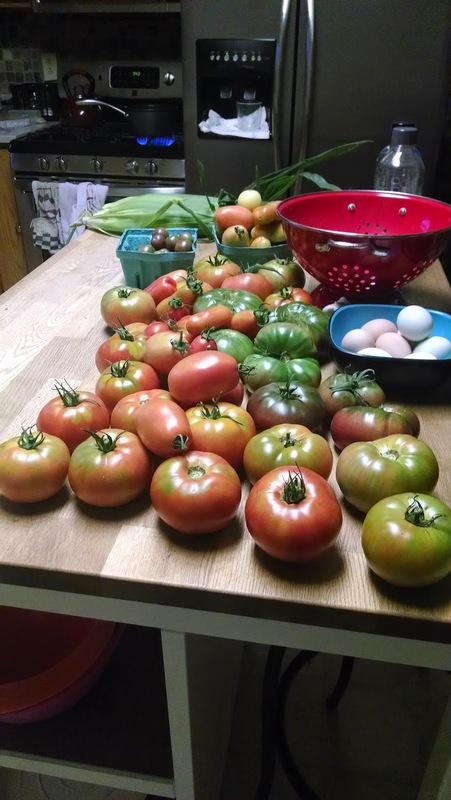 Really, this post should be subtitled "The Tomato Jungle" because that's pretty much what we have going on right now. It's kind of a hot mess in our backyard right now. But let's start with a few things that aren't tomatoes. After the great chard harvest of 2014, the plants are rebounding and we're getting another batch. I hope this lasts into the fall. It seems like our bell pepper plant is slowing down, but this poblano one? It has exploded with tiny peppers, just recently. Where the heck were all these guys in August? Storms have collapsed some of our corn stalks, but we were able to salvage the ears of corn from them so really this just looks worse than it is. Now if I can just get the broken stalks out of there so it stops looking so much like a scene from the Wizard of Oz. Beans need a final pick, but I haven't been able to get to them because of this situation. Those pictures are from two different pickings, within 4 days of each other. Our tomato plants have been heavy with green tomatoes for more than a month, and recently they finally decided to start to ripen. Like gangbusters. I pick some of them slightly early, as soon as they turn a little bit red, because of this situation. The plants are so big they are collapsing over their too-small cages (that was our big fail with these things this year) and falling out to where the chickens can reach them. So I try to grab them as soon as they go slightly red, to bring them inside to ripen, outside of the reach of the tomato hungry ladies in the backyard. Some of the stalks are breaking and dying off, which is probably due to their weight. Not pretty or garden blog worthy, surely, but I can't complain about how much these plants have produced. Though seriously, we have to do better with caging and trellising next year. This one is just begging to be set free. So far, we've been freezing tomatoes to keep up with them. 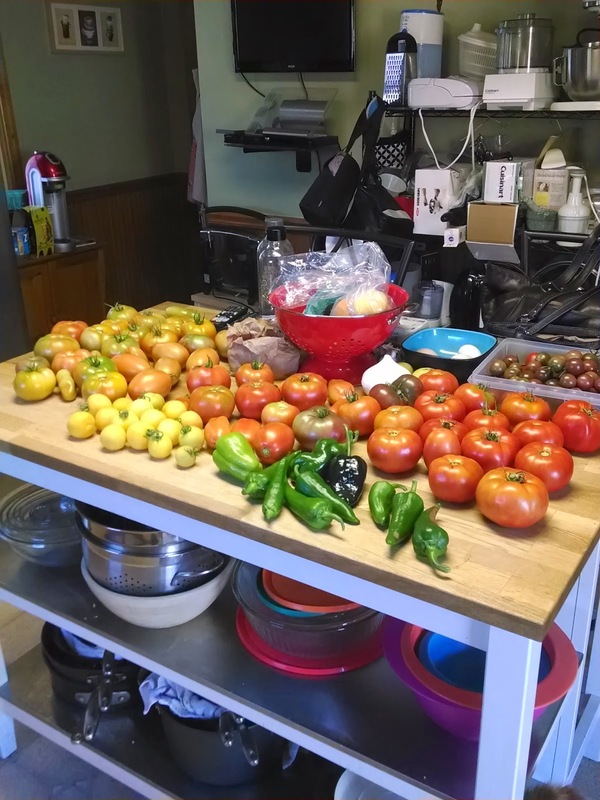 I'll do a post on that at some point, too, but from just a fraction of the tomatoes in that first photo of the on our island, I got 15 pounds of frozen tomatoes, ready for sauce and chili. I hope to can at least a batch of them this year, if not two, and possibly do some salsa as well, depending on how the peppers look. We've done more freezing than canning this year, which is weird, but at the same time, we've had less available weekend time due to triathlon and marathon training. We've been able to preserve most of the tomatoes from the garden thus far. I just hope I can keep up as we get the final deluge! How's your garden doing? Are you still harvesting or ready for fall? I'd try freezing to keep up with some of them, since it takes a lot less time than canning. 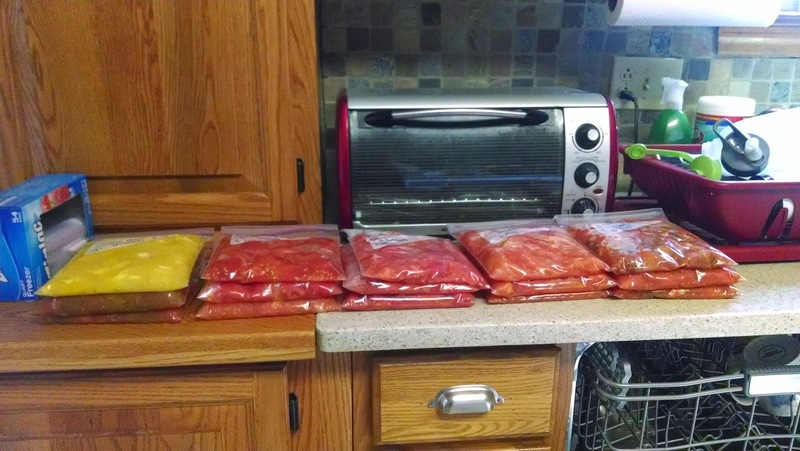 Once they're skinned, they just go in bags and we lay them flat in our chest freezer so they take up less room. But even with freezing, we just can't keep up. Plus I'm starting to wonder if we even will get through all the preserved ones all winter. A good "problem" to have, but still. I wish I could just do this stuff all day! Next Gen House has moved!